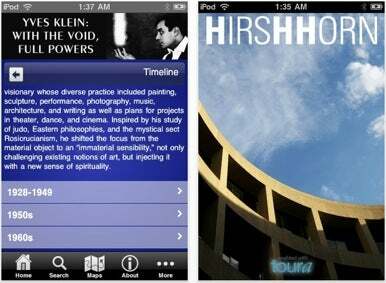 The Smithsonian Hirshhorn Museum and Sculpture Garden has released the first mobile app offered by a Smithsonian art museum: a virtual tour through its retrospective on French modern artist Yves Klein. Klein, who took the European art scene by storm in the 1950s is considered one of the 20th century’s most influential artists. The Hirschhorn is the opening venue for this massive retrospective, which features examples from all of Klein’s major series, including his Anthropometries, Cosmogonies, Fire Paintings, planetary reliefs and blue monochromes, as well as selections of his more obscure works. Also on display are numerous sketches, photographs, letters, writings, and several performance and documentary films. The app, which runs on any iPhone, iPod touch, or iPad running iPhone OS 3.0, is powered by Toura, a platform for the creation and launch of smartphone-based mobile guides for the travel and tourism industry and its customers. With Toura’s app technology, the Smithsonian will be able to offer mobile tours for future exhibits, happily giving us a chance to experience world class exhibits without having to travel to Washington D.C.